Flange-Mounted Furnished with a Clean-out design in ANSI Raised Face Flange (RFF) sizes of 1/2" through 3". In-Line Threaded Furnished with a Clean-out design in threaded or socket-welded pipe connections of 1/4" through 1". Saddle-Welded Furnished with a Clean-out design, for use on pipe sizes of 1" through 8". Drop-In Welded Furnished with a Clean-out design for use on piping 4" or larger in diameter. 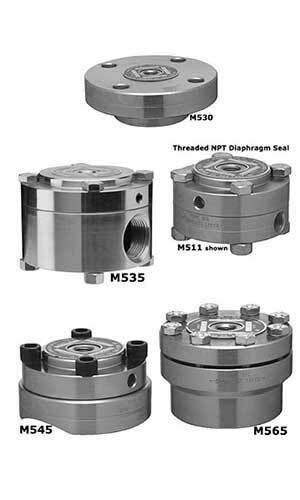 Mini & Compact Provides an economical way to isolate and protect pressure instruments from corrosion and clogging. Sanitary Intended for use in the food and pharmaceutical industries, or in any application where a thorough cleaning of the wetted surface is required. Protective devices that isolate a pressure sensing instrument from the process fluid being monitored. Especially useful when measuring corrosive or viscous pressure mediums.